KIEV, Ukraine -- Former Ukrainian President Viktor Yushchenko says the recently adopted tax code could lead the country to "total bankruptcy, total control, total corruption," RFE/RL's Ukrainian Service reports. Ukraine's small and medium-sized business owners have said the new tax code is unfair and are demanding that President Viktor Yanukovych veto it. Thousands have gathered in central Kiev and other Ukrainian cities in recent days to protest the legislation. Yushchenko told RFE/RL on November 22 that he has not met with the protesters and said he hopes the protests "will not be politicized and privatized by some rogue political force." 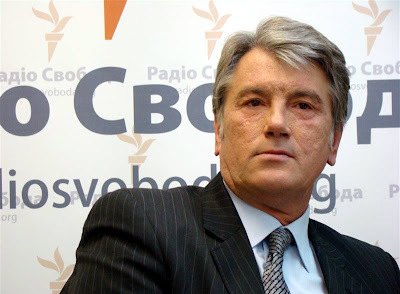 Yushchenko, who spoke to RFE/RL while attending the Kiev photo exhibit "Georgia 2000 vs Georgia 2010," said a national discussion should be held in order to find a consensus between officials and the business owners about the tax code. "The easiest solution would be for President Yanukovych to veto the law, period," Yushchenko said. "I think that trying to reconcile the current version of the [tax] code [between the two sides] is impossible." Arseniy Yatsenyuk, a parliament deputy from the Front for Changes political party, who finished fourth in January's presidential election, also said the latest version of Ukraine's tax code is counterproductive for the economy. "[These protests] are an act of survival for millions of Ukrainians who do not understand why they should pay taxes when big businesses do not pay taxes, for instance, by setting up off-shore zones or due to double-taxation agreements with [countries such as] Cyprus. Where is the social justice?" Yatsenyuk questioned. Yatsenyuk said Front for Changes has provided buses for the protesters but decided not to show its party symbols at Kiev protest gatherings. Yanukovych said in Brussels on November 22 that he will meet with protesters sometime this week to study their demands regarding the tax code. Several hundred demonstrators have set up a tent camp in the capital's central square, while protest leaders have pledged to bring more people to the protests later this week. But a Kiev court has banned protest rallies until November 27, and on November 23, police began asking protesters to leave the square.